A disturbing discovery led authorities to launch a full-scale investigation. Around 10:00 Monday morning a body was discovered between South Weinbach and South Green River Road. This is an area that sees quite a bit of traffic, especially from thrill seekers. “It’s not uncommon for people to come down in this area with trucks, with four wheelers, and go off-roading,” says Sergeant Jason Cullum. This area is also prone to flooding which can be dangerous. “The conditions they were dealing with were a little bit treacherous,” says Sgt. Jason Cullum. Since people visit this area often, it’s common to see random vehicles parked nearby. Those vehicles have caught the attention of some people living in the area. “I put a gate up here trying to keep four-wheelers, you know, dirt bikes anything out because there is no business for anyone being out there,” says property owner, Thomas J. Trem. Last Friday, a farmer called police after noticing a truck had been parked there for a few days. “There’s been a truck back there for a while and you know nobody knew who it belonged to or anything like that,” says Trem. This discovery led police to send up a drone Monday morning turning this abandoned vehicle investigation into something much bigger. 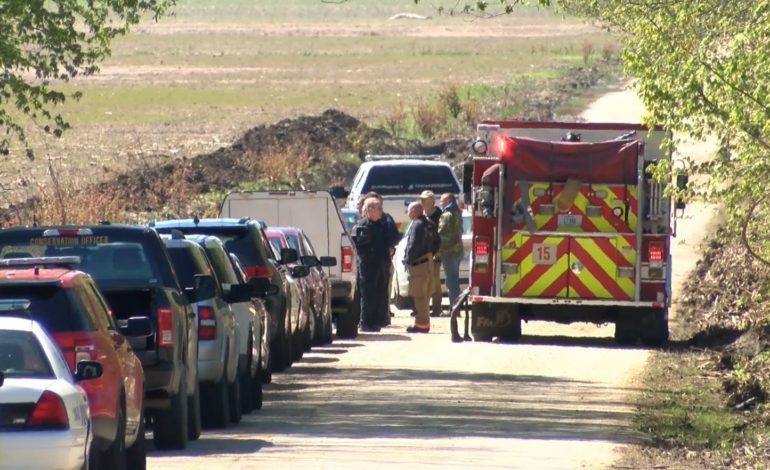 “The truck that was found on Friday was connected to a missing person case,” says Sgt. Cullum. Police say they have no reason to think foul play was involved.